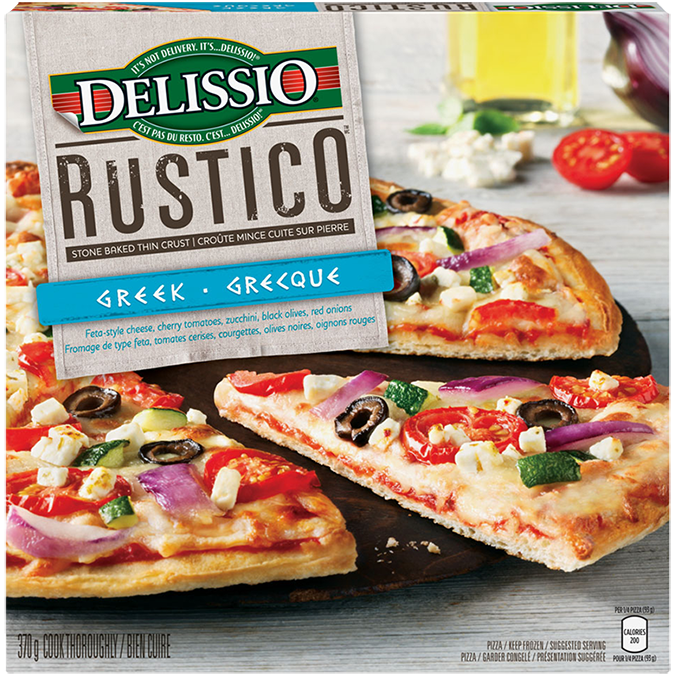 A taste of the Mediterranean on a stone-baked thin crust. Feta-style cheese, cherry tomatoes, zucchini, black olives and red onions. A pizza night just for you. Cook it on the BBQ for a summertime #pizzanight! Cook thoroughly. For food safety and quality, product must be cooked thoroughly to a minimum internal temperature of 160°F (71°C). Your oven temperature may vary so adjust cooking time and temperature as necessary. Keep pizza frozen until ready to bake. Caution: Pizza will be very hot. (1) Preheat oven to 425°F (220°C). (2) Remove frozen pizza from all packaging. (3) Place frozen pizza directly on middle rack of preheated oven. Bake for 14-16 minutes or until cheese is melted and crust is golden brown. Let stand for 2 minutes before serving. Preheat the barbeque to medium heat, approximately 400°F. Remove the pizza from all packaging and place the frozen pizza on a baking sheet. Place the baking sheet on the barbeque and close the lid. Cook for 10 minutes and then rotate the pizza 90 degrees and cook for another 9-11 minutes until crust is golden brown and cheese is melted. The only way to top Quattro Formaggi Pizza is to literally top it – hors d'oeuvres style.